Specifically, there is the so-called positional superko rule, in which case it is the position which cannot be repeated, or the situational superko rule, in which case it is not just the position, but also the situation (i.e. the player to play) which cannot be repeated. Bill: Robert Jasiek's previous comment still applies: Something wrong here. Some Ko-rules allow one repetition, but not more. The superko rule also has other implications; normally the board position repeats after a few moves (in the above example, after six moves). However, the sequences of moves, which produce the same board position, can be large and involve captures by both sides. As long as both parties are unwilling to play another line of play (they both consider the play which leads to the 'superko' optimal) then the superko situation will arise. 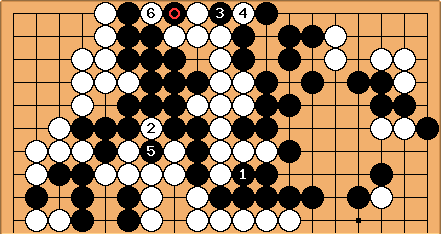 It should be noted that, under current Japanese rules, situations which would be prohibited by a superko rule will lead to a no-result (not jigo), and not to a loss for the player who plays the move. However, the positions are very rare. I have never seen one in real life. When they do occur, they are normally talked about a lot - because they are so rare. If either player is leading enough to discard a group here then the game may be continued. Otherwise, if the winner is determined by who kills here, they have to fight three ko. 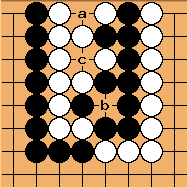 Black captures at a, White at b, Black at c and then White has to capture at a if rules allow a return to the initial position. Bill: Err. White would win the triple ko, that's all. Later: Somebody altered the diagram caption to say that Black was to play. That is not necessary. It is still a triple ko, regardless of who has the move. The same is true for a simple, direct ko. One player with the move can win the ko, the other player can take the ko. We could even be in the middle of a superko fight. White might have taken the triple ko, capturing a stone at a, and Black might have just played a ko threat. 1980-05-25, Matsuoka Akira - Yanagawa Hiromasa? 1984-05-24, Qjan Yuping? - Katoka Satoshi? ,  These seem to be the same, though they are attributed to different players. I don't know which is correct. John F. Re "the" historical game - what are you referring to? The linked site clearly says 1724 then the lunar date. Harleqin: Sorry, I made the footnote clearer now. John F. I'm still none the wiser - the players are the same. Harleqin: Um. No, they are not. One says "Sansa - Rigen", the other "Inoue Shunseki - Nagano Kaizan". Bill: The link is to the 1724 game, despite the URL. You obviously have the GoGoD version since you use our dating, but the year's the same either way. Harleqin: I think I have most of these games from Jan van Rongen's "Friday Night Files" site and from gobase. I use the dating I like, in order to sort my records chronologically. I say "the" because it's not the only historical game - there is also Sekiyama-Ito. We can't claim to be complete, but as a benchmark you may wish to note that GoGoD has 12 triple ko games, 10 quad ko and 2 chosei (not quite all on the CD yet). We have a note of a quintuple ko in an amateur game in Japan, but haven't seen it yet. Can anyone construct such a monstrosity? Harleqin: Is that a rhetoric question? It seems rather trivial. Forcing one in a real game is, of course, another thing ;). Chris Hayashida: I don't know about the quintuple ko, but when I hear of a historical game with a triple ko, I think of the one played by Sansa and Riken the day before Nobunaga was betrayed. It was also referenced in the Hikaru no Go manga. I suspect this is the "historical game" that he is referring to. I don't know what the date is of that game, nor do I know if the web site is correct.